Baja Fresh came on board with Creative SEO services with the need to get much better visibility on the top search engines for their online food delivery model. They required a mobile eommerce app to accept orders online and manage delivery status records. Like most e-commerce sites, the site is dynamic and had a dynamic URL structure, with only a few blog pages. Creative contracted them for optimizing entire website with SEO contract for 30 keyphrases. Baja Fresh Mexican Grill Restuarant Singapore is one of the popular mexican restuarants in Singapore with 3 outlets in crowded localities of Singapore. Their objective was to increase sales by accepting orders online and provide food delivery any where in Singapore. And for this they required online traffic from organic search results. Increase rankings on top food industry keywords like “Order food online Singapore”. Get rankings on food specific keywords like Best place to eat tacos Singapore, Best mexican restaurant Singapore, Order tacos online Singapore. Our challenge was to convert high graphic dynamic pages and dynamic URL into SEO friendly pages and increase the visibility of the website. Creative installed a blog for posting keyphrase specific posts and clients restaurants menus, offers to social networking sites and improving text to image ratio for better ranking of those keyphrases in search engines. The site already had beautiful design and functionality, but lacked in keyword rich content and was not architected to be search engine friendly. We started by simply adding and optimizing some keyword rich content pages for all of their branded. Another significant hurdle that we needed to address was the fact that the site had very little existing link popularity. Even with good optimization of the site architecture, content, and code the site needed to improve link popularity in order to have success in the search engines. So we starting promoting website in all the food specific popular blogs, forums, and social groups. 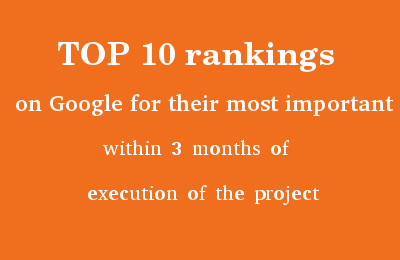 They have achieved TOP 10 rankings on Google for their most important within 3 months of execution of the project and the overall rankings have more than tripled.